Mornay is a village and commune 40 kilometres north-west of Macon, and 11 kilometres north-east of the town of Charolles. 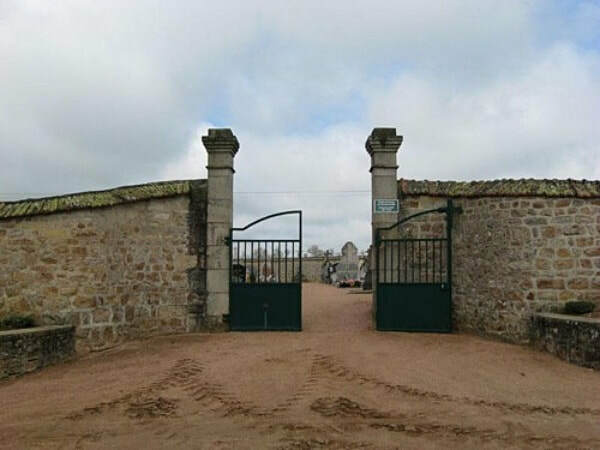 The communal cemetery is on the north side of the village west of the road to La Croix. The one British airman's grave is at the far end of the main path and left of the entrance. Incident: Following an engine failure the pilot attempted a forced landing but crashed into a tree at a spot called Les Jeandeaux. The pilot was killed instantly but the second crew member, Sidney Baker, was thrown out of the plane. Suffering from serious burns he was recovered by local people and taken to Charolles hospital. 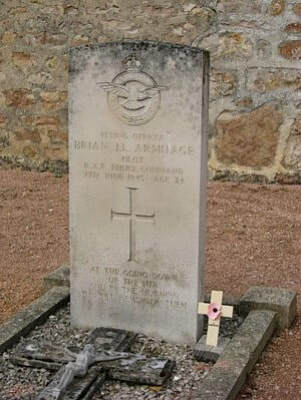 187356 Flying Officer Brian Joseph Lincoln Armitage, Pilot in Royal Air Force Volunteer Reserve, died 7th June 1945, aged 24. Son of Stuart Lincoln Armitage and Ida Armitage, of Roundhay, Leeds, Yorkshire. INSCRIPTION. AT THE GOING DOWN OF THE SUN AND IN THE MORNING WE WILL REMEMBER THEM.